Tea preparation is not, and should not be, rocket science. The goal is enjoyment and hospitality. However, there are some basic requirements to making a good cup of tea, and some practice may be necessary to achieve this goal. We suggest that when trying a new tea, follow the recommended guidelines below a few times until you achieve your own desired taste. You may want to measure the tea, and watch the infusion time. The idea is to eventually develop an intuitive nature through practice and knowledge, and to not focus on the technical aspects. The most important ingredient is one’s ability to approach tea with the correct spiritual nature. Tea Leaves: Starting with fresh, good quality tea is the most important step. See our storage guidleines below to keep your tea as fresh as possible. Use the proper amount, and change the leaves often. Most batches can produce 2 to 4 good infusions (flavor and nutrition-wise), but after this (or after the pot has been sitting for a while), start with a new batch of leaves. Always strain leaves completely when pouring. If your pot does not have a fine strainer built in, just use the finest mesh tea strainer available. Water: Unlike black & oolong teas, most Japanese teas brew at below the boiling point. Flavor and astringency components emerge at at different temperatures with different teas, and experimentation may be required to find your taste preferences. It’s a common practice in Japan to brew 2nd & 3rd infusions slightly hotter to bring out astringency. If available; soft, filtered is best. Hard water’s calcium carbonate content creates a dull, flat flavor. Time: Green tea leaves, after opening, will release their peak flavor faster than most other teas. Don’t steep too long, and pour out ALL of the tea with each serving. Never allow leaves to continue infusing in the pot between servings. Tea Ware: The iron-rich, unglazed wares of Tokoname, Banko, & Mumyoi produce good flavor and retain heat well. But, they are best used for only one type of tea. Never wash with soapy water or harsh chemicals. Porcelain, especially with a blue-green hue, produces the best color, and may be useful in trying new teas to visualize the final product. Glazed earthenware provides warmth, texture, and a tactile experience. It also provides a wide variety of design and color, and the surface makes them functional for a variety of teas. Choose tea ware based on your mood, your tea, the season, or your menu. Note that when referring to tea brewing directions in Japan, the average serving may only be 110 ml (a bit less than 4 oz.) 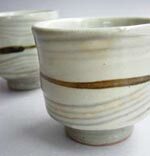 Larger yunomi (tea cups) used for genmaicha, bancha, houjicha, etc. may be 150ml (approx 5oz.) Japanese recipes may also list in grams or in “kosaji” (tea spoons.) For the reasons above, we recommend measurement by weight. If a scale is not handy, 3 grams is approximately 1 teaspoon for most teas. An average tea cup size in the US may be 6 oz (180 ml) and the tea quantities below should be increased from 2 to 3 grams for this water amount. Also, don’t have an infrared cooking thermometer on hand? Neither have tea masters throughout the ages. Pour the correct amount of freshly boiled water into your tea cup to warm it up. Watch the steam; at 90-100C it rises straight up, at 70-80C it drifts sideways, 60C water shows just slight steam. Now pour this properly cooled water into the pot. You may also use a separate “yuzamashi” (water cooler) for this purpose. For matcha, tea can be whisked by a bamboo chasen (our preference,) or with an electric aerator. If using a chasen, soak the whisk in hot water a bit to soften the tines. You can also warm up your tea bowl at the same time. Discard this water, and dry out the bowl (wet matcha tends to clump.) Matcha should be sifted prior to use to dissolve evenly. For a single serving, you can just sift some through a fine strainer right into the bowl (much like dusting with powdered sugar.) Add the proper amount of hot water and whisk briskly in a rounded “M” pattern until the matcha is dissolved and a fine foam appears on the surface (much like the crema on a well-pulled espresso.) Matcha will settle if left to sip slowly. Traditionally, a 60cc/2oz serving is drunk in three and a half deliberate sips. Tea Storage is also an important ingredient for delicious tea. Please keep our nitrogen-flushed tea packages unopened until ready to use. Once opened, tea leaves should be kept in an air-tight container. Keep tea free from dust, light, heat, and humidity. A chazutsu (tea canister) with an inner lid is typically used in Japan. Although some people may keep tea in the freezer or refrigerator between servings, it’s not recommended as moisture may develop each time the container is opened and the tea is exposed to air. Unopened tea may be kept in cold storage, but if properly packaged it will keep unopened for well over a year. Once opened, it should be used as soon as possible.